Today we have a very special episode for Disabled Access Day. Today Emily and Laura are joined by listeners and contributors to share their views on how more fashion and beauty brands can be more disability inclusive and accessible. Special thanks to bloggers My Blurred World, Gem Turner, Life of a Blind Girl and Luke Sam Sowden; well as listener Joanna for taking part in todays episode. Share your thoughts on how you think more brands could be accessible in the comments or tweet us @InclusiveStyle. Be sure to subscribe to the Podcast for more! Today Emily shares with us her outfit for her recent appearance with UK charity Scope in the #EndTheAwkward campaign. 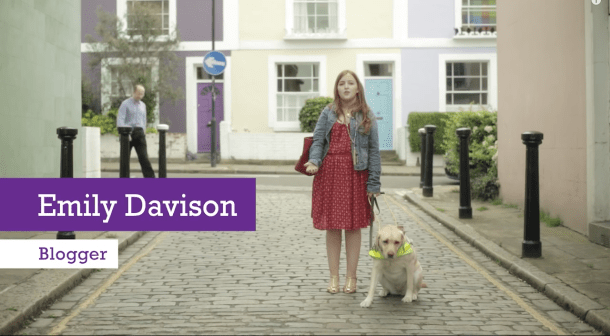 The campaign is aimed at raising awareness of disability and ending the awkwardness and stigma that surrounds disability by getting people to share their awkward stories on social media. Emily’s described when she was out and about how when she asked someone for directions instead of talking to her the person instead beat down and gave them to her guide dog! If you would like to share your awkward moments under the #EndTheAwkward. If you would like to volunteer as a transcriber please email us at fashionabilitychannel@gmail.com.